WOW. 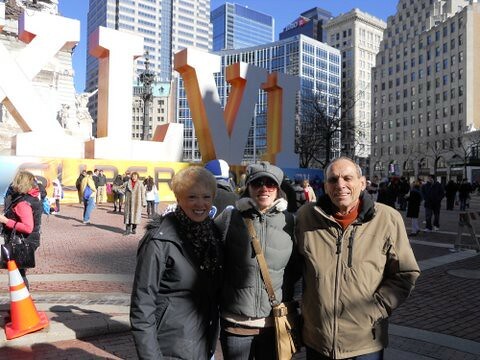 When I learned the city I lived in was hosting a Super Bowl, I had no idea what it really meant and how involved I would really be. 1. 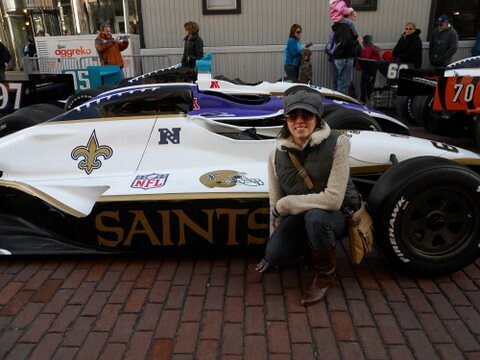 Introducing myself to Sean Payton (because he cares who I am) – He was shopping at the Huddle with his family not making a scene, so I didn’t want to either. I walked up, introduced myself, was extended the handshake (which was received) and said I enjoyed watching his team’s season, made the Magnificent Brees connection, then wished him that my city would treat his family well and hoped he’d enjoy his time here. 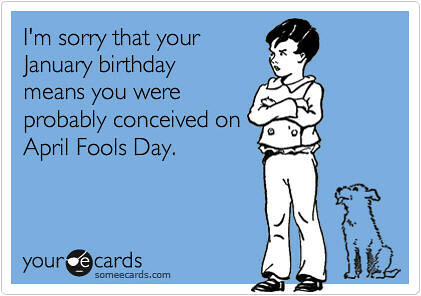 Speaking of, the parents came down over the weekend to celebrate. 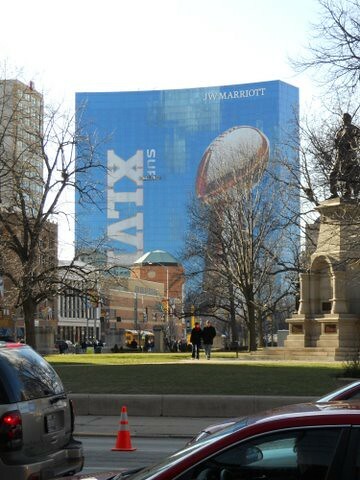 Since we won’t likely be this close to any Super Bowl action again, we hit the streets downtown to take in the sights. 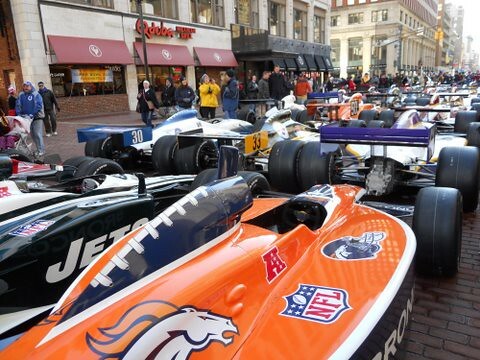 Monument Circle was closed off and lined with Indy cars painted like each NFL team. Couldn’t tell if they were in any particular order but if they were, I’m betting the Colts car was last. There are banners every where you look including a 33 story tall one on the side of the JW. They aren’t even finished with it. 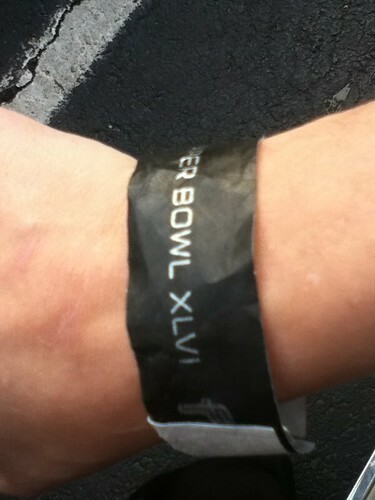 You can see the guys trying to finish the word “Super Bowl” just to the right of the “X”. After lunch we decided to duck inside to the NFL experience and see what they had. 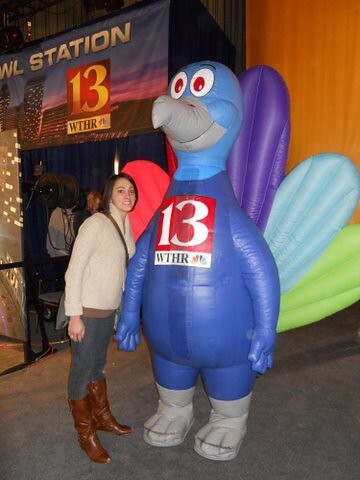 It is really geared toward kids, but it kept us from the cold. The had several kicking, punting, catching areas netted off inside the Convention Center. It was a massive spread. Some adults would line up to see if they could hit a 40 yard field goal. 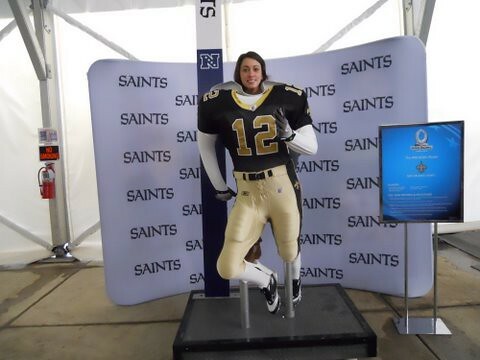 They also had player statues that you could stand up in for a photo op. Every team’s player was #12. Not sure why but a quick Google search points to the 12th man of the team being the fans. 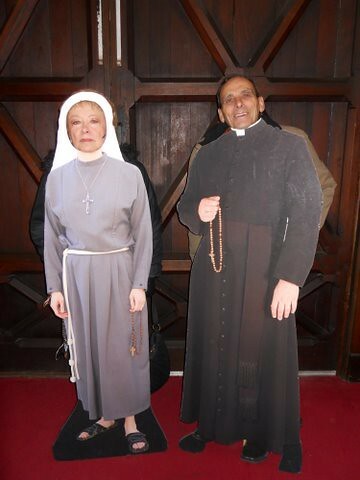 Of course, I found the Saints. They had a locker room area with a team’s most popular player jersey staged like it was his real locker. 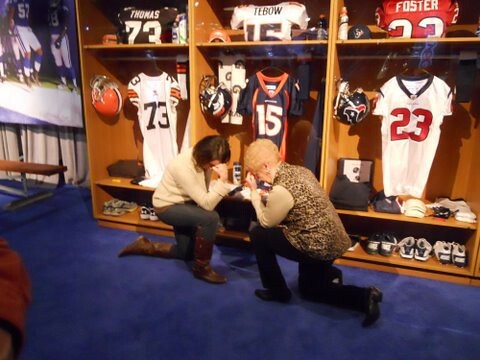 Mom wanted in on the Tebowing craze. As we left, St. John’s church had a catchy sign that said “If you think the zip line was a thrill, step inside and see what Jesus has to offer.” Dad likes architecture, so we stepped inside to find the greatest photo op I have ever seen. Whoever at St. John’s had this idea, well done! 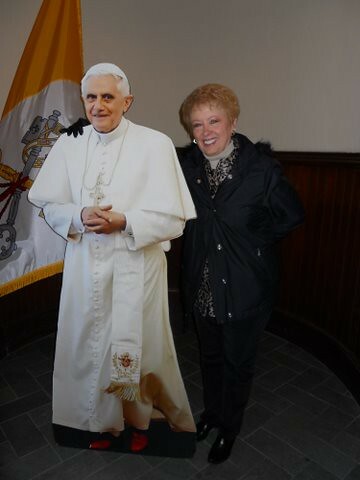 And Mom got to meet the Pope, kinda. Final order of business was for Dad to certify the zip line brackets for my ride coming up! He said they were correct and I should be safe to sail down Capital in a few days! I love you both, thanks for visiting with me! It wasn’t the most exciting game to watch, but I had fun making my jersey for our outdoor showing of the Colts v. Saints led by 2 Boilermaker QBs! I took my Manning jersey and turned it into a Painter jersey with some crafty tape, foam, and hot glue since this city (or any for that matter) doesn’t make Painter jerseys. One of my fellow alums clearly had a better night than the other during the game, but the outcome was what we all expected. Maximus hosted on his patio, including a heating lamp, freshly scented air enhancers, and scrumptious hors d’oeuvres. 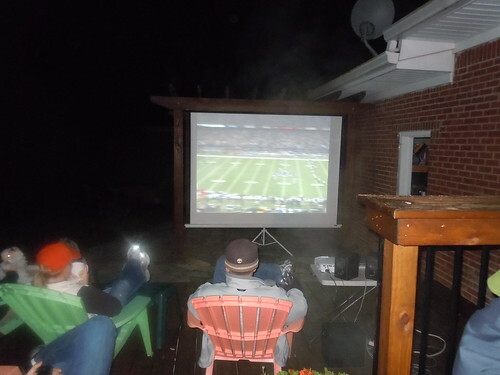 Makes me want a projection screen for my patio! 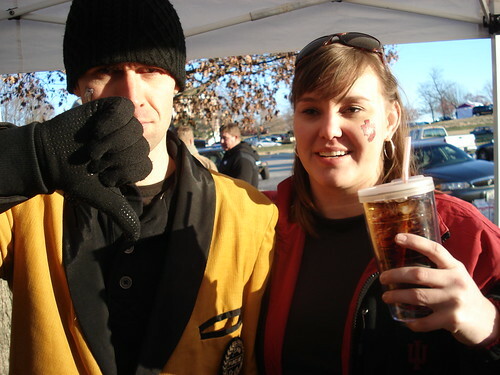 We had a small but comfortable gathering for the IU v PU football game this year. It was an early morning start at 7:30am to make sure we had plenty of time to tailgate and fill our bellies before going into the game. 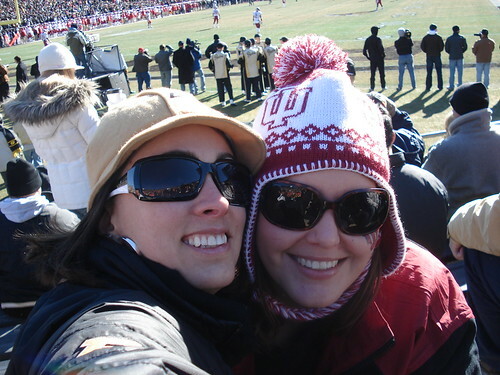 K and I left at half time to rejoin those at the tailgate that didn’t get tickets. That’s where we watched the my boilers tank it in OT. K was happy. Maximus was not, but he looked stellar in his gold jacket. Then the tom foolery set it in. A little game of stick ball in the street. 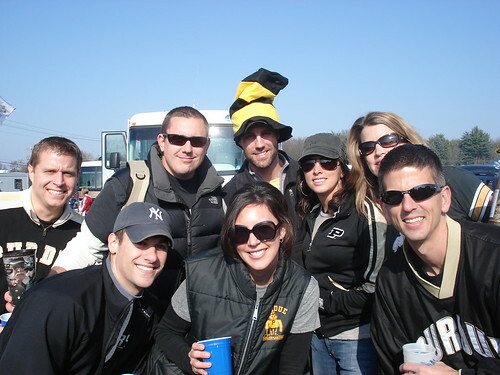 The loss of the Oaken Bucket sucked, but always a good time with friends. Now that I work downtown, it seems I tend to hang out down here more often too. 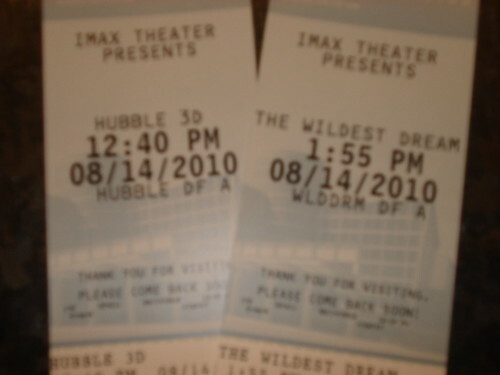 On Saturday, I headed over to my new favorite IMAX hangout for another 3D adventure. To our surprise, they were also showing a feature on climbing Mt. Everest. Just what I needed to keep my thoughts focused for this coming weekend. Hubble 3D was pretty cool during the footage of the astronauts fixing the telescope. At times, they floated right over your head. But then it got fairly involved in the actual photos its been able to catch. It was a bit over my head thinking about millions of bazillion stars and gases and galaxies that are millions of bazillion light years away. Boring. The wildest dream was full of magnificent landscape shots of Everest. It was the story of finding Mr. Mallory’s body on Everest and attempting to recreate the climb using the equipment and navigation methods of the last time he tried to summit the mountatin about 75 years ago. Which is still unverified if he ever made it. The movie certainly tells you it’s perspective. 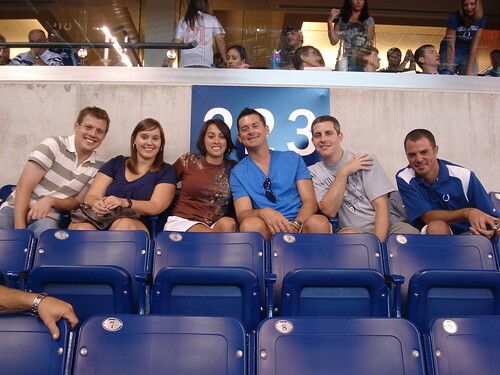 Sunday brought the first pre-season Colts game. My group had some lunch and headed to the festivities. I made a new friend while at the game but he wasn’t very talkative. If some other things fall into place, I think we can work through that small issue. 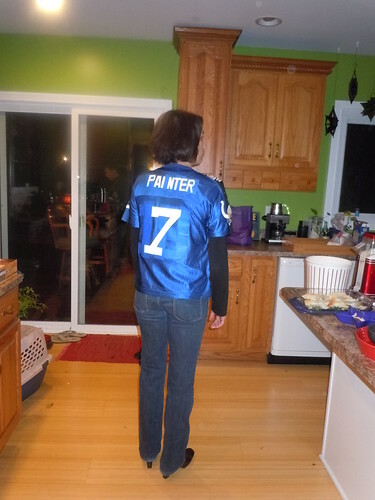 Today is the final Colts Blue day before the Superbowl. 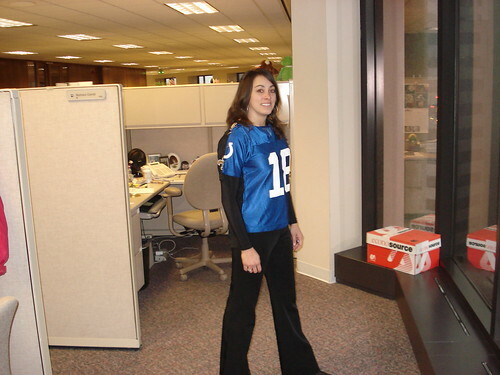 Each week of the playoffs, my company (and everyone in the city) encourages you to support the team by wearing any Colts apparel to work. I have a Manning 18 jersey, but never wore it to work because the real team I was supporting is in that other NFL league and would most likely be the opponents to my city in the Superbowl. Guess what happened… the Saints made it! 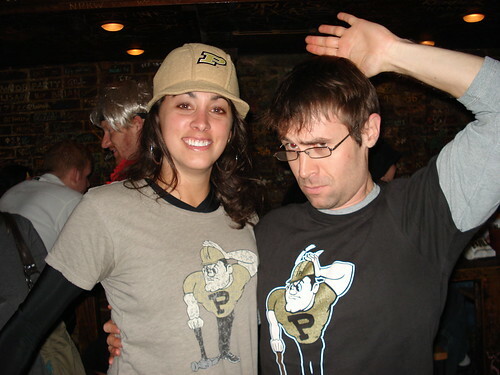 I’m assuming it’s fairly obvious why I’m a Saints fan, but to be clear, Drew was the quarterback during my years at Purdue. 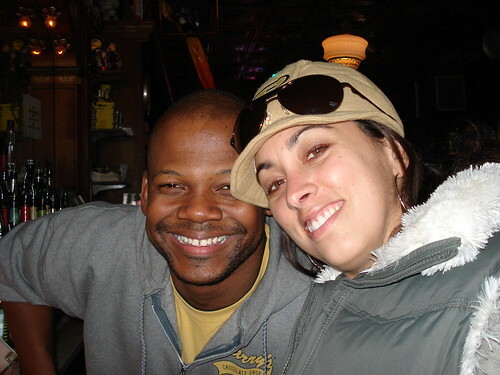 I had 1 class with him, which when he did attend, kinda slept a few times, but it’s ok. He was here for football. Academics came 2nd. I’ve followed his career since he left college, even at the Chargers, who are not very welcome in this city either. So as each playoff week took place, and the Colts blue days occurred, I secretly wore a black shirt covered by some Colts blue inspired shirt but never wore a logo until today. 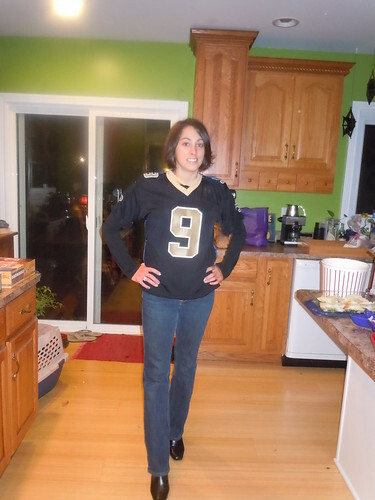 But I couldn’t just wear the Colts logo because in my closet I have a Brees jersey too. I didn’t think it fair to wear one or the other because I support both teams for different reasons. Just wear the Colts jersey and I’m not being true to a team I have followed all year. 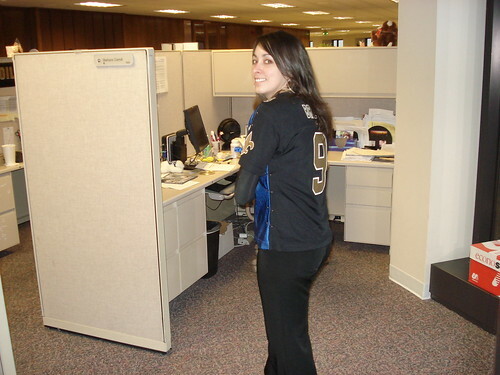 Just wear the Saints jersey and get stoned to death by my co-workers. So, I wore both without ruining either of them. Best jersey eva. Getting some funny looks, a few funny questions, but it was well received. We’ll see how Sunday plays out. I’m watching the game at a very loyal Colts fan’s house but he is also a Boiler alum. I called ahead to make sure it was ok to sport a black #9 jersey. 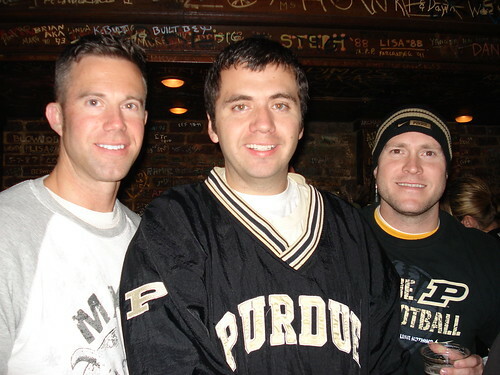 I was granted permission only because it’s a Purdue alumni player but I am not allowed to cheer for any other player dressed in black that day. Deal. Either way, it will be a good victory for it’s own reason. Let’s hope for a big day of offensive plays! 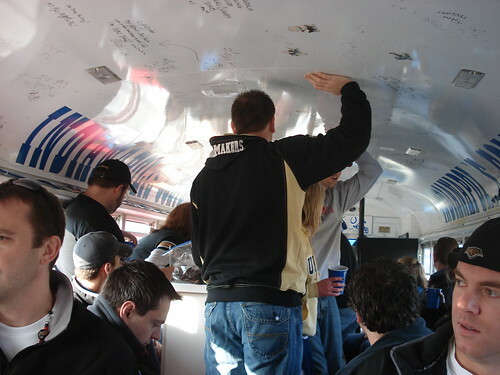 The big rivalery this year over the Oaken Bucket took place at Bloomington on Saturday. 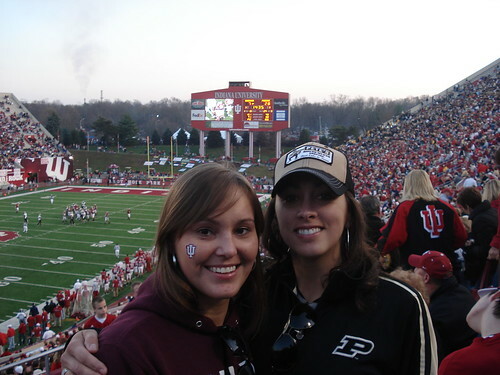 I have a lot of Purdue friends, but one important IU friend in K. She joined me for the trek to the south. We arrived to Blaine’s in Broadripple to take our seat on the Colts bus. We had a pretty good size crew this year and a nice mix of red/white and black/gold. Everyone pitches in with food and drink so there is plenty to keep us busy while we travel to IU. We only had one bad accident of some flying meatballs due to a car cutting the bus off in traffic. 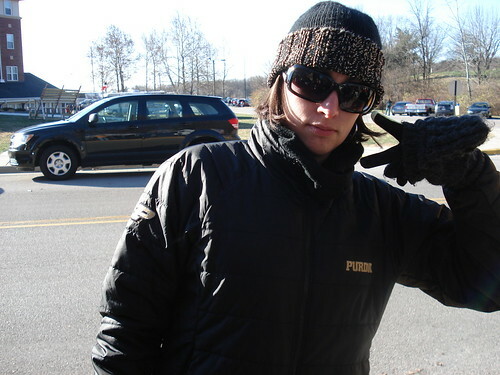 The majority of the meatball episode landed on one girl. It covered her back, but I had some residual damage on my jeans and gym shoe. Figured, not a big deal compared to her so, let’s just move on and keep partying. We got to the tailgate lot to set up the grill and toss the ball around before heading into the game. The bus has a restroom on it. And the shitter was full, so we let Russ and Nicole take care of that. 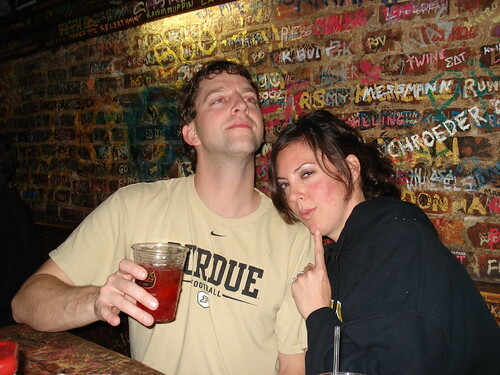 Purdue took the early lead and never looked back. That’s 2 years in a row! Keep it up Boilers! I think K took the loss just fine. We arrived back at the bus and waited for our crew to return. 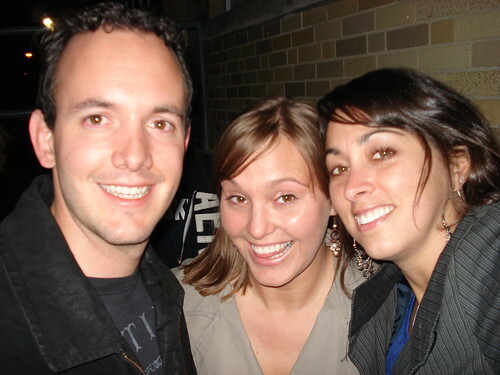 They weren’t returning fast enough, so K and I found a ride back with an old high school friend who also happens to be my fellow volleyball teammate, Adam. Thanks to Adam and Carlos for giving us a lift back to Indy! Thanks to Blaine and his crew for planning the outing! It’s been a sports filled couple of days. Starting with Thursday and 3 losses for Testespikes. We played like crap. All of us really. We had to pick up a sub since we still can’t figure out our other girl player. We’re going to have to lock this down for next session. I can’t handle it anymore. Friday came and went with the Boiler victory in basketball, but not so lucky on Saturday with the Boiler football against the Spartans. K and I headed to OPT to catch the action since IU was playing too. MSU scored on Purdue almost instantly, so we had a huge hurdle to overcome right off the bat. I thought we had the game in control until the 4th quarter. It was ugly. So we lost, and I have to pay up on my wager with Mrs. Fleury since she’s an MSU alum. 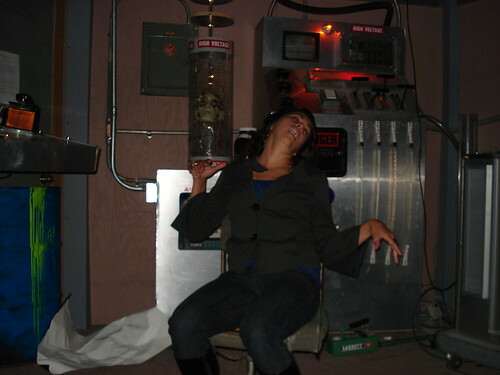 Sara, let me know what time your spawn goes to sleep and I’ll bring the booze. As K and I were walking to my car, I noticed some major bird poo on my windshield. I had parked right under some powerlines where a massive flock of birds was resting. They did a real nice job of unloading on my car. 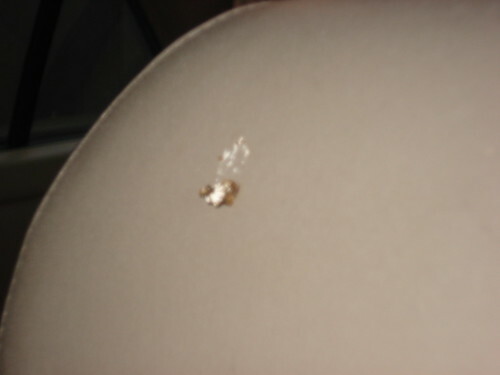 And the best part… I had left the sunroof open and some of the little shits hit my head rest. 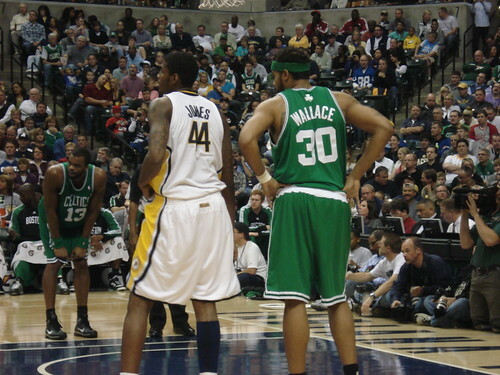 My friend Nate, who I get to cheer on at the 2010 Boston Marathon, offered me a courtside Pacer ticket to Saturday nights game. Count me in! Here’s our crew. We arrived fashionably late and had to walk on the court to get to our seats. 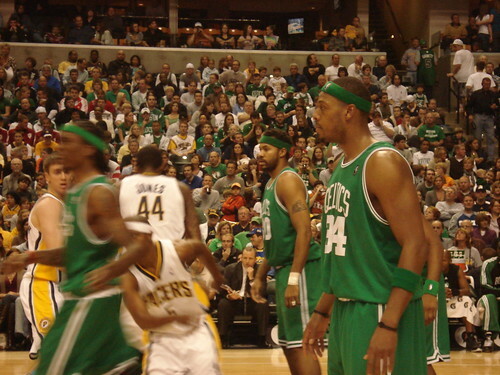 NBA players are huge, but being on the same floor as them really showed their size. Kevin Garnett is 6′ 11”! I felt about 4 foot tall! But up against this guy, I felt 7 feet tall. He was just a wee lil’ guy. 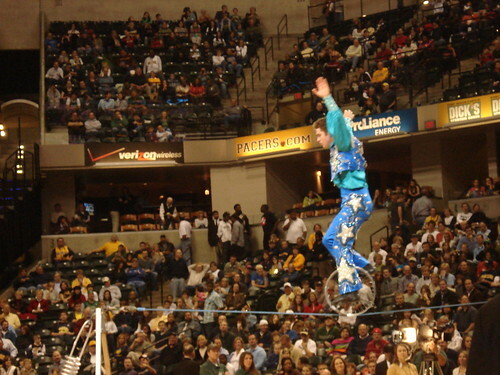 The half time show was lame. He had nice pants though. He kept falling off the wire. Bring back the dogs. During the game, I was able to meet up with another friend that was attending the game and see my company’s CEO enjoying himself in our suite. I didn’t know we had a suite here too! New goal set for me! I’m happy to report the Pacers were victorious! Thanks boys for letting this HUGE Pacer fan get in on the game! Off to watch the Colts now! Well, we didn’t get a championship belt in flag football this year, but I think we probably earned the best-at-Average-Joes award. Second place will have to do for now. Plus we played a team in the finals that had a different set of players for offensive AND defensive line ups. Who does that?! Next year, we will make plays and routes… if the team will invite me to play again. I did drop one in the end zone today, but I showed up better than Peyton, even though he got a victory at the end of the day. Can someone please invent a day-stretcher? I really don’t want it to be Monday already. Rewind to Friday. 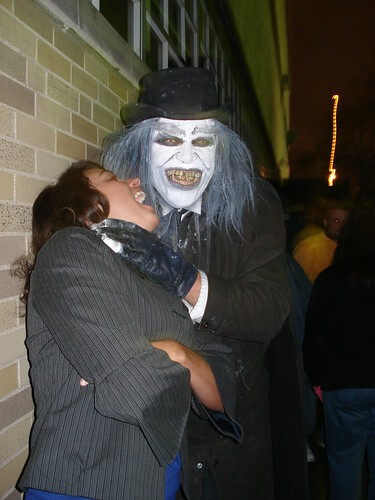 K, Brian and I hit up Necropolis for some scare time. I don’t get scared easy. I’m more the type that will try to figure out when and how something is going to scare me, not wait for it to scare me. 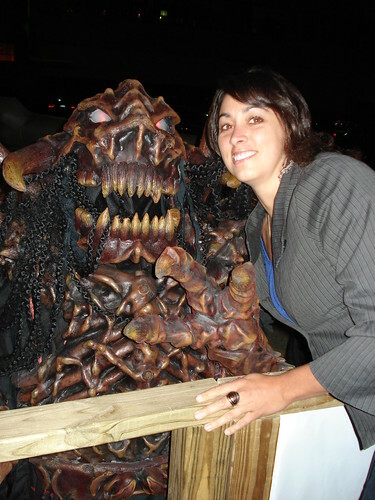 As we were in line waiting our turn, I met my next boyfriend(s). This was worth the $26. They certainly put a lot of effort into this. There were 3 different sections, including one with a flash light that only worked when they wanted it to. 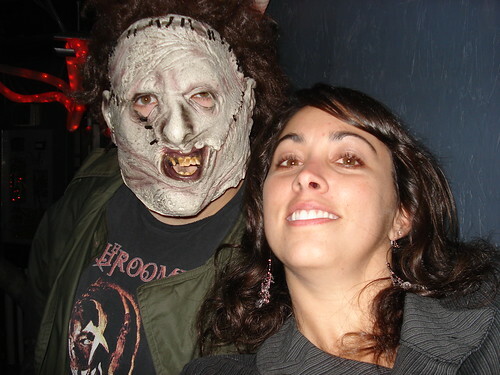 One of the creepers let me get in on the action. The best room was completely black with Jason-esque hockey masks on the wall. All of a sudden, one or a few of the masks would start coming at you but your depth perception was way off to really figure out what was going on. It was awesome! 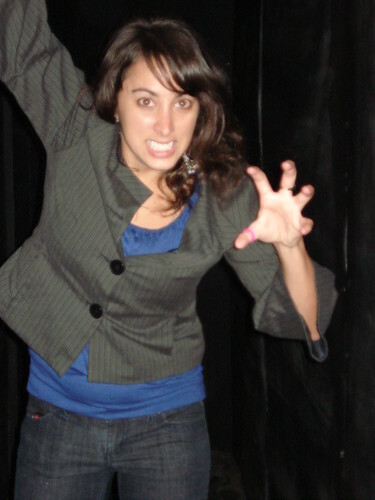 Here is my best scary face. We rounded off the night by seeing Mike and Joe play at the Vogue. The crowd seemed to be every IU alumni that now lived in Indy. 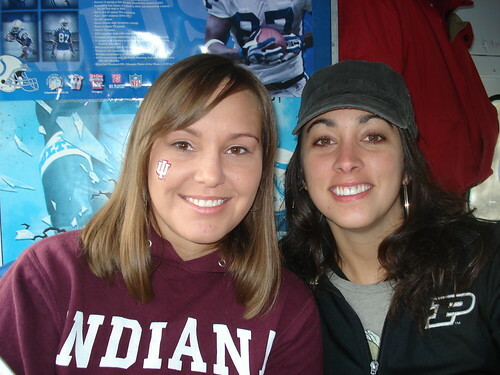 Saturday morning came too quick and before I knew it, I was whisked away to West Lafayette with friends. I didn’t have a ticket for the game, but my desire to satisfy the nagging Harry’s urge over powered me. Greatest bar eva. Especially with my boy K9 behind the counter. Matching Pete’s were in the house. 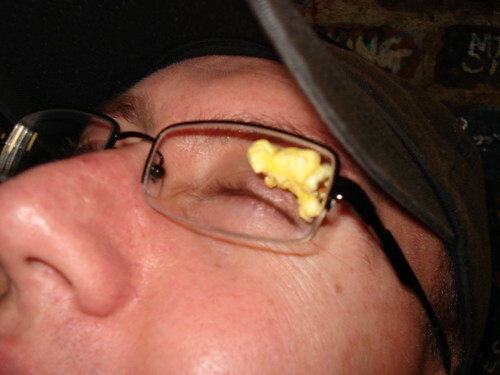 Mitch was money on nailing people in the eye with popcorn. He got me, Tim and Rick. My cat like reflexes allowed me to shut my eye but not turn my head when he nailed a piece at me. Tim was not so lucky. Breakfast club was in full effect. I don’t care who you are, but seeing adults dressed up in costumes at 10 am is disturbing. Just drink like the rest of us. 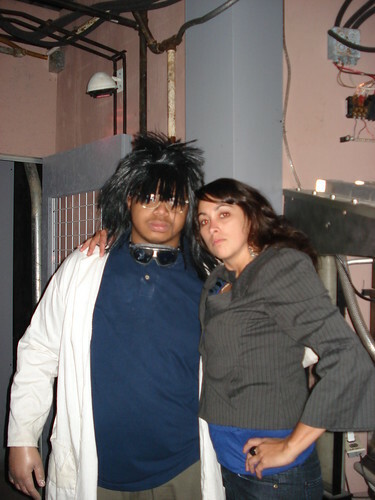 Here is one of the college kids. 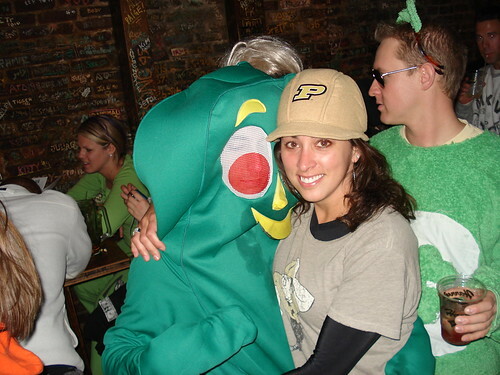 Gumby was drinking beer through the mesh, sans straw. I think you can see here that he probably really needed the straw. I took it easy Saturday night with some Saki and Penguins. Great combo. It’s what winners do. 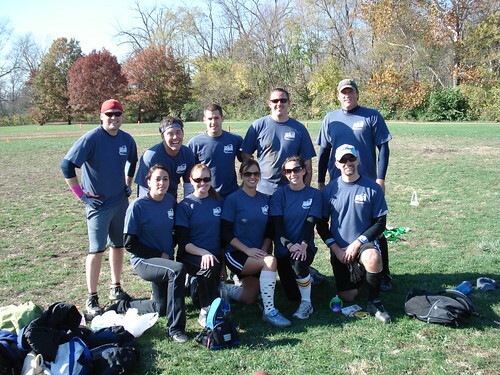 Sunday was ushered in with flag football playoffs. I made a few catches, knocked down some defensive balls. It was a good victory for team Touchdown My Pants. I feel a championship belt looming. Cheers to another fun filled weekend! 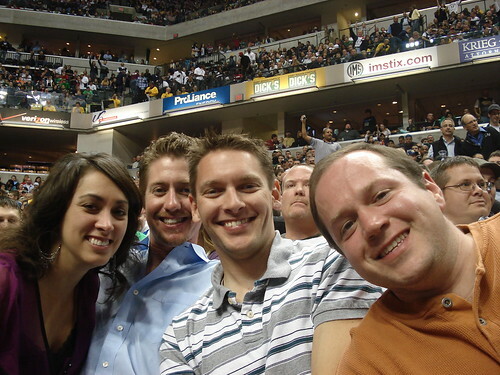 Posted on October 25, 2009 Tags Basketball, Football, Friends, Music, Purdue, SportsLeave a comment on Over Already?